What is cadence and how can I estimate it? How to use bike cadence and speed calculator? This bike cadence and speed calculator will help you to estimate what is your speed when cadence is known or the other way round - determines the cadence if you know your speed. Choose your chainring, cog, wheel size, tire size and speed or cadence, and we will tell you the rest. 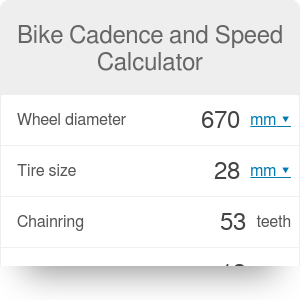 Whether you are looking for a cadence calculator or bike speed calculator, our flexible tool is a good choice. Remember that the longer the period is, the better the cadence estimate obtained. Practice makes permanent, and after some time you can make a good guess of your cadence. Determine your bike parameters, such as wheel and tire size. That may be equal to 27" and 1.5". Choose the chainring and cogs values, for example 50 and 14. The ratio between them is called gear ratio. Use it as a bike cadence calculator: if you know your speed - for example from GPS device - you can calculate the cadence. Use it as a bike speed calculator: if you know your cadence - for example from cadence sensor or rough estimation - you can find your speed. If you want to determine average speed based on distance and time, use our speed calculator. Bike Cadence and Speed Calculator can be embedded on your website to enrich the content you wrote and make it easier for your visitors to understand your message.